This was the largest demonstration in the history of Barcelona with 1,8 million people showing up exceeding all previous records. 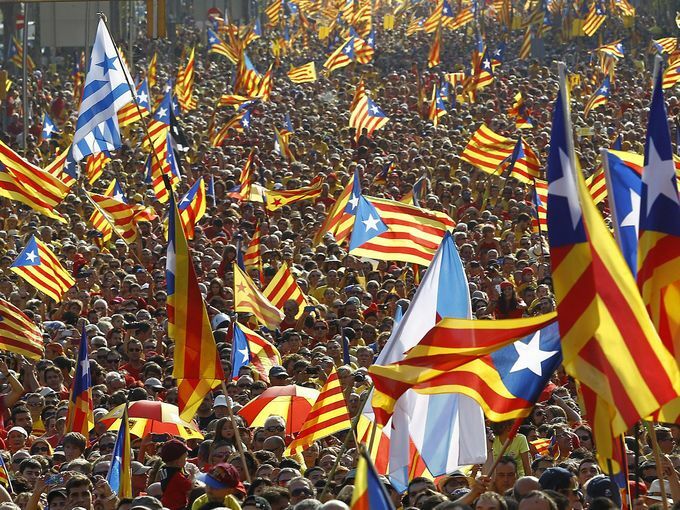 Demonstrators were waving independence flags and wearing yellow-and-red shirts with the phrase “Now is the time” shouting “Independencia!” as they swarmed into the semiautonomous area in northeastern Spain that hails Barcelona as its capital. What is clear, we are seeing the beginning stages of what we have warned about – the rise of civil unrest that leaded to nations dividing or being overthrown in revolutions. What has taken place in Scotland is by no means going unnoticed. Catalonia has 7.6 million inhabitants and this is a very important region for Spain. Despite the economic crisis and an unemployment rate of more than 22 percent, Catalonia is around one fifth of total gross domestic product of the Southern European country is generated. Proponents of secession from Spain think an independent Catalonia would achieve a higher standard of living. Queen Isabella I of Castile and King Ferdinand II of Aragon formed Spain for they were married on October 19th, 1469 when Isabella was eighteen years old and Ferdinand a year younger. Their marriage united both crowns under the same family since they were cousins and this marriage formally created one kingdom – Spain. Our timing models showed the beginning of tension in 2010.8 and these demand will start to really rise 2015.1. So far, everything is on point. Spain appears to be divide by 2036.